The dynamics and electronic absorption spectrum of enhanced cyan fluorescent protein (ECFP), a mutant of green fluorescent protein (GFP), have been studied by means of a 1 ns molecular dynamics (MD) simulation. 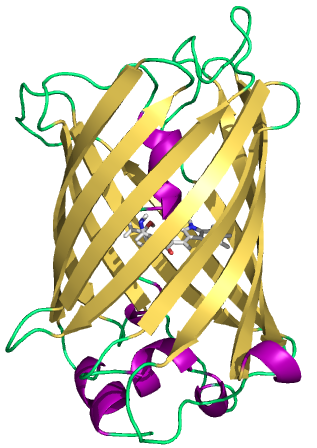 The two X-ray conformations A’ and B’ of ECFP were considered. The chromophore was assumed to be neutral, and all titratable residues were taken in their standard protonation state at neutral pH. The protein was embedded in a box of water molecules (and counterions). The first result is that the two conformations A’ and B’ are found to be stable all along the simulation. Then, an analysis of the hydrogen-bond networks shows strong differences between the two conformations in the surroundings of the nitrogen atom of the indolic part of the chromophore. This is partly due to the imperfection in the β barrel near the His148 residue, which allows the access of one solvent molecule inside the protein in conformation A‘. Finally, quantum mechanical calculations of the electronic transition energies of the chromophore in the charge cloud of the protein and solvent water molecules were performed using the TDDFT method on 160 snapshots extracted every 5 ps of the MD trajectories. It is found that conformations A‘ and B‘ exhibit very similar spectra despite different H-bond networks involving the chromophore. This similarity is related to the weak charge transfer involved in the electronic transition and the weak electrostatic field created by ECFP near the chromophore, within the hypotheses made in the present simulation.